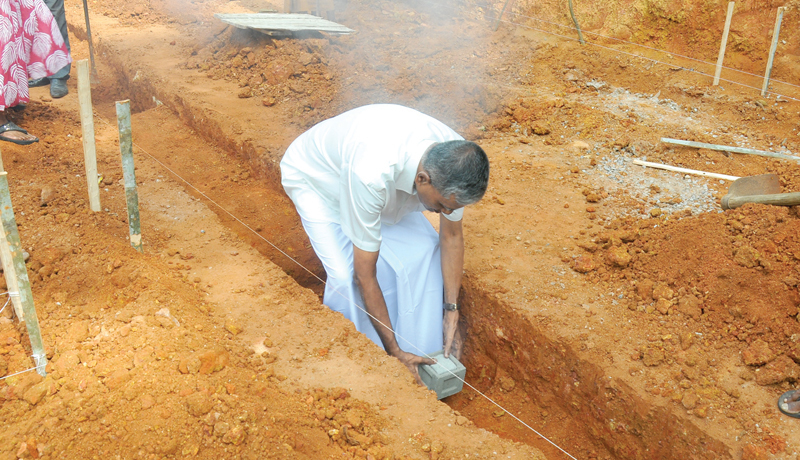 A foundation stone being laid. The staff of the Dompe Amarapiya Memorial Elders’ Care Centre, with assistance from a philanthropist, laid the foundation stone for a new elders’ care centre in the area on March 13. The Amarapiya Memorial Elders’ Care Centre; located in Uda-Mapitigama, Dompe; is one of two elders’ centres dedicated for the visually-impaired. The centre is managed by the Sri Lanka Buddhist Association for the Blind at Yakkala. It is, at present, facilitated for 12 visually-impaired elders, and the management has planned to expand their services to similar youths seeking shelter. The same philanthropist who donated his house and land for the centre and the management of the Elders’ Care Centre was the individual who aided the recent endeavour as well.